Wireless Headphones allows you to listening to video programs in your vehicle so kids in the rear can hear their game or movie while the adults up front can listen to their music undisturbed by the program playing in the back seat. The wireless headphone requires car video system to have an IR (Infra Red) audio output which most do. Many of our rear seat entertainment systems come with one or two sets of wireless headphones already though additional sets can be added for as many people who need them. Dual Channel wireless headphones are also available. They are required when you have more than one active video screen in the same area playing at the same time each with its own program content. 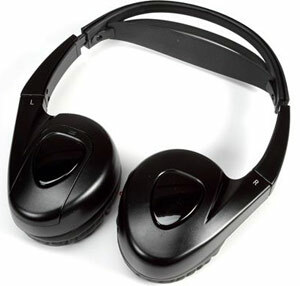 The viewer can flip a switch on the dual channel headphones and choose to listen to whichever video screen they want. If you want everyone in your vehicle to listen to the video without having to put on wireless headphones, the audio can be routed through the car’s speakers. This is a simple option that is often set up with a new system or it can be added to your existing video system. Just ask us. Questions on Wireless Headphones, Headrest DVD or Rear Seat Entertainment? Come into Our Store and talk with a real Car Video Expert!